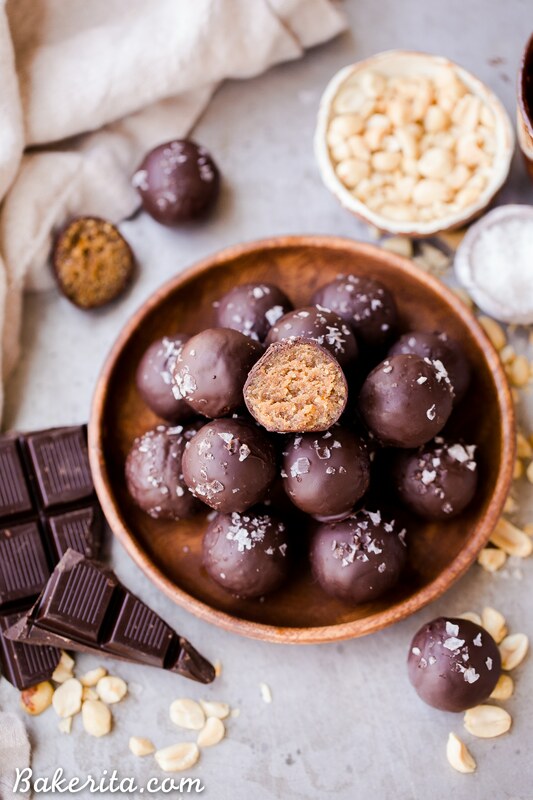 These Chocolate Peanut Butter Truffles are decadent, delicious, and made with just FOUR super simple + clean ingredients. 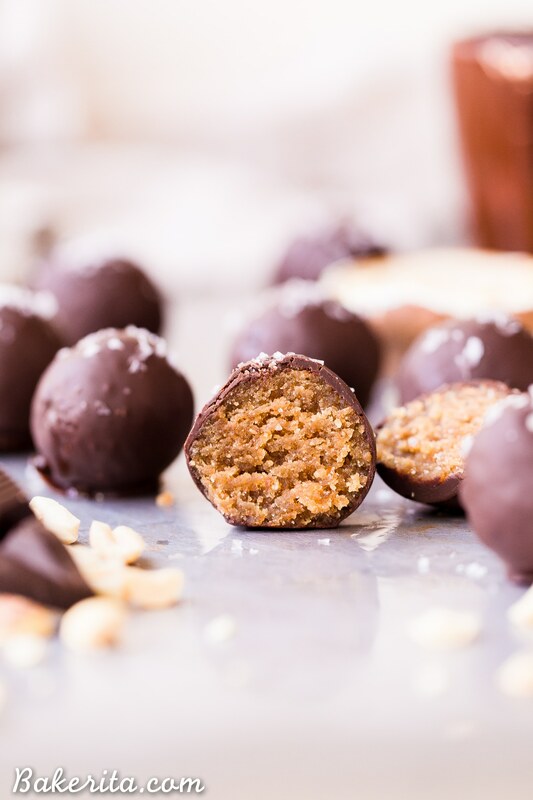 They’re gluten-free, vegan and sweetened with dates – they can also easily be made paleo by using a different nut butter! 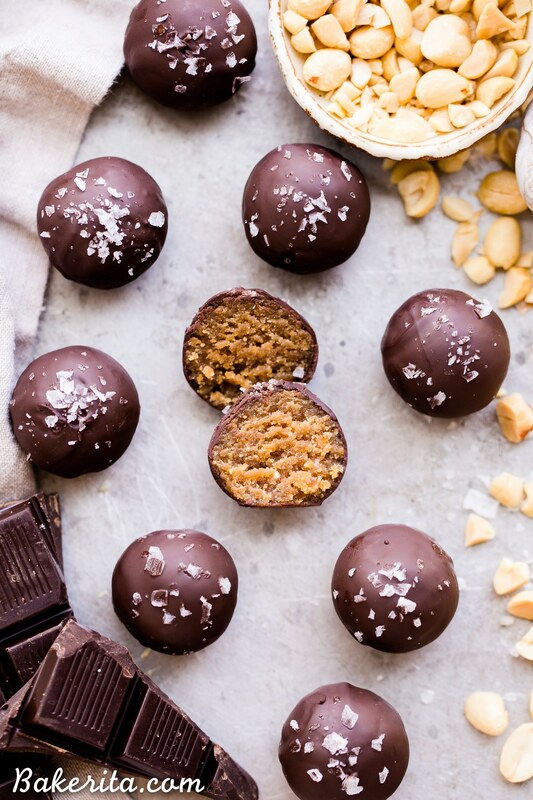 These truffles are sure to satisfy your chocolate peanut butter candy cravings. And let’s be honest: with my obsessive love for everything chocolate and peanut butter related, I just couldn’t wait for all of you guys to get your hands on this recipe and start making them! The best part of this recipe is how dang simple these are – they are made with just FOUR ingredients, no baking or cooking of any kind necessary (just melting chocolate in the microwave, but I don’t think that counts), and they can be done in just 20 minutes. They can also be made paleo or nut-free super easily, just swap out the peanut butter for your fave nut or seed butter. Using tahini, pumpkin seed butter, or sunflower seed butter will make the most delicious nut-free truffles everrr !! Peanut butter – duh, and as mentioned, you can sub in your fave nut or seed butter here! Medjool dates – make sure they’re soft ones! 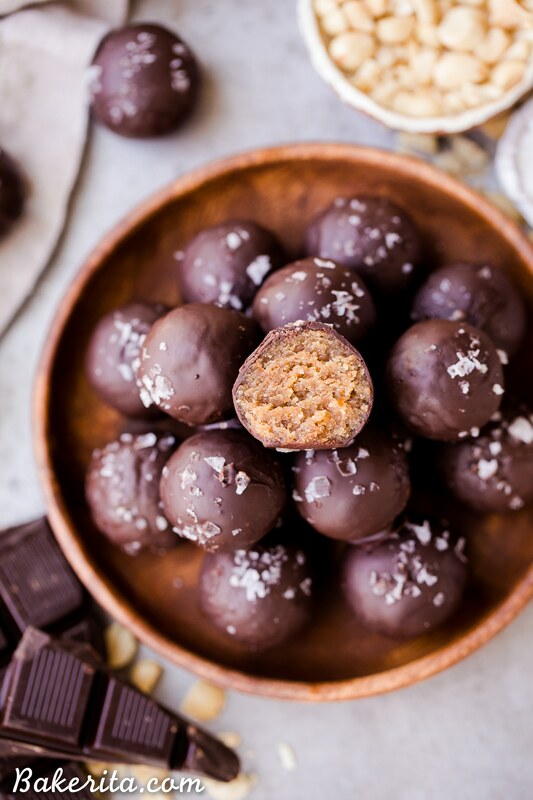 The ingredients are simply blitzed together in a blender or food processor until smooth, rolled into balls, and dunked into a smooth dark chocolate bath (my kind of bath, am I right?!). So simple, with rich peanut butter flavor, a chewy texture, and a smile on your face, guaranteed. Enjoy, my friends! 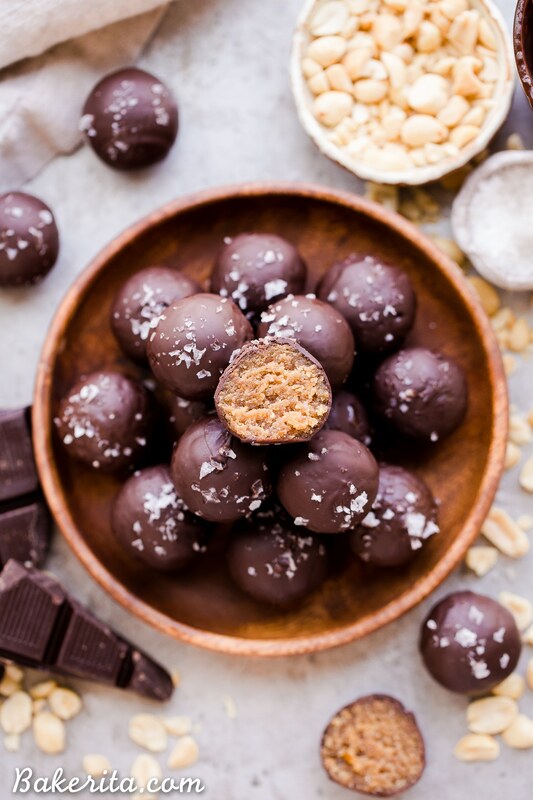 These Chocolate Peanut Butter Truffles are decadent, delicious, and made with just FOUR super simple + clean ingredients. They're gluten-free, vegan and sweetened with dates - they can also easily be made paleo by using a different nut butter! 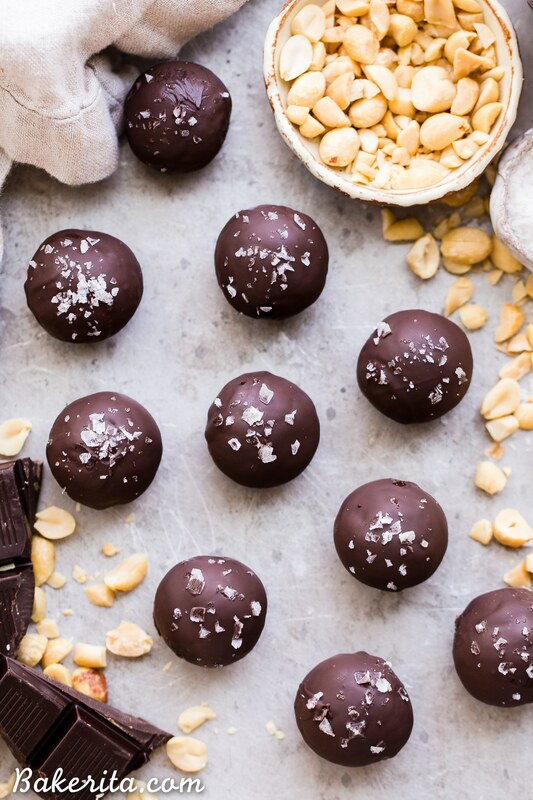 These truffles are sure to satisfy your chocolate peanut butter candy cravings. Blend to combine, and if it’s still a little dry, add the other 2 tablespoons of water. Scoop into tablespoon-sized pieces and roll into the shape of a ball and place on a plate. Repeat until all of the peanut butter mixture is used. Place in the freezer while you melt the chocolate. Place your chocolate in a small but deep microwavable bowl or cup. Microwave in 30 second increments, stirring between each, until the chocolate is fully melted. Using a fork or dipping tool (I use the round one from this set *link*) to dip each ball in the melted chocolate, letting the excess drip off before placing on a parchment-lined plate or baking sheet. Sprinkle with flaky sea salt, if desired, while the chocolate is still melted. Repeat until they’re all dipped and then transfer to the refrigerator to let set. You'll probably have extra chocolate. Keep stored in the refrigerator for a few weeks or in the freezer indefinitely. Enjoy! Recipe adapted from these Chocolate Peanut Butter Truffle Bars! I absolutely cannot wait to make these!!! Like buckeyes but SO much healthier for you and tastier too! Totally! Thanks so much for the love, Brittany. I just made these and they are setting up now. I had to add quite a bit of extra water and even with frequent stops, my vitamix overheated. I had to transfer to my mini food processor to finish up. Hi Carol – how odd! My Vitamix handled these just fine without any stops at all. Were your dates soft enough? Hope you enjoy them. Can i sub coconut flour for ground almonds? Hi Kelly, that’s changing the recipe in a way I haven’t tested it, so I have no idea. It might work but since I didn’t try it, no guarantees. You’ll want to use 2-3x the amount of ground almonds/almond flour in place of the coconut flour since coconut flour is much more absorbent than almond flour. Oh my loooord how HOW do you make the tastiest desserts so healthy??? You’re a wizard! You’re too sweet, thanks Kayle! Does it matter what kind of peanut butter is used? Natural or regular? I always use natural 100% peanut butter! Thank Alejandra, hope you love them! Any chance peanut butter powder might work in this? Hi PS, I don’t use peanut butter powder so I have no idea, but it would definitely need to be rehydrated. I cannot WAIT to try these!! Thank you for sharing. Hope you love them, Suzanne! These looked amazing so I had to try them! I added a few tbsps of almond flour as I thought it would make these a little “cakier” and it worked. They are delicious! Thanks so much for sharing your recipes! So thrilled you’re loving them, Cindy!! Thanks for the feedback.